Nine of the best designers from around the world will be faced with unconventional materials to make the unimaginable, fashionable. 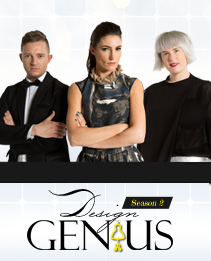 This fashion-packed series has designers competing for a chance to win $20,000 cash prize. In this 6 part series, every episode three designers compete in three unique challenges; an accessory, an undergarment and a wardrobe apparel piece. They are given one inspiration throughout the challenges with one goal, to achieve a single cohesive look under a time limit. Designers will have to be flexible, inventive and creative in order to construct with the mandatory materials provided. In the end, only one will be crowned, “The Design Genius”.